The Topaz model lets you upgrade your existing masonry fireplace with an attractive and energy-efficient fireplace insert. Tavern Brown firebrick and a forced air blower come standard, and there are three sizes to choose from to best fit your fireplace. Natural Flame burner systemAuthentic fire viewing — The aluminized pan burner produces realistic, randomly dancing flames. 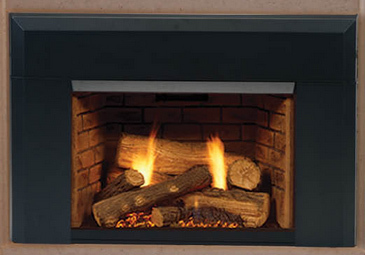 Its large ember bed and glowing ceramic fiber logs add to the overall fire viewing experience. 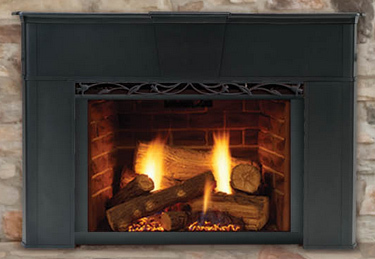 Standard Blower IncludedIncreased efficiency — The heat-activated blower features variable speed controls to help distribute the fireplace’s warmth efficiently. Up to 30,000 BTUsWarmth and comfort — You’ll stay nice and warm while efficiently heating the room to help lower heating costs.